oh golly, i'm just buzzing these days. i'm on a hooray-i-have-a-sense-of-purpose-and-i-feel-like-i've-found-my-passion high. this blog post has been floating around inside me for a little while now. it's been hard to pin down and type down and make sense of because there's just so many pieces to it. so i might just try and identify them bit by bit, and hopefully they find some shape and form along the way. a few months ago i went to work at a farm. nope, it all started before that. a few years ago, i buried my mother. then a couple later, i buried my father. both died from cancer. one was a shock, the other was shocking. i wanted to talk about it. then i didn't want to talk about it. rinse and repeat. i've been trying to heal and find myself ever since. i became an island. or more of an island than i already was. i thought frequently about the pointlessness of connection and relationships, since they are all destined to split apart or fracture from death or disease or disinterest (i was feeling pretty dramatic).. and then i thought even harder about the total importance of connection and relationships, for the same reasons. and i felt lost. which isn't strange. don't we all feel lost sometimes? i dithered and wavered about what my livelihood and love and purpose would be based on. i veered away from what i had studied at university. i started creating and finding purpose in collections of stitches and the clicking of needles and i became a crafter. i became obsessed with the completion of things because it reminded me that everything in our lives is created by our minds and our ideas and our hands. and it gave me a sense of control over things. and then i remembered that before things became bleak, i had wanted to grow things. i had wanted to tend to something - to create something that could nourish and feed me. heal me. feed others. heal others. everything i had learned at university had actually pushed me in that direction and towards that field. i had started my studies with the desire to save the world, and at the end of it, i just wanted to do as little harm as possible! i wanted to use my hands and my heart and my mind and just do good things. i realised that food was important. i realised that the way we grow food is crazy important. and somehow, i wanted to be apart of that process. and so i looked for farmers doing good things. 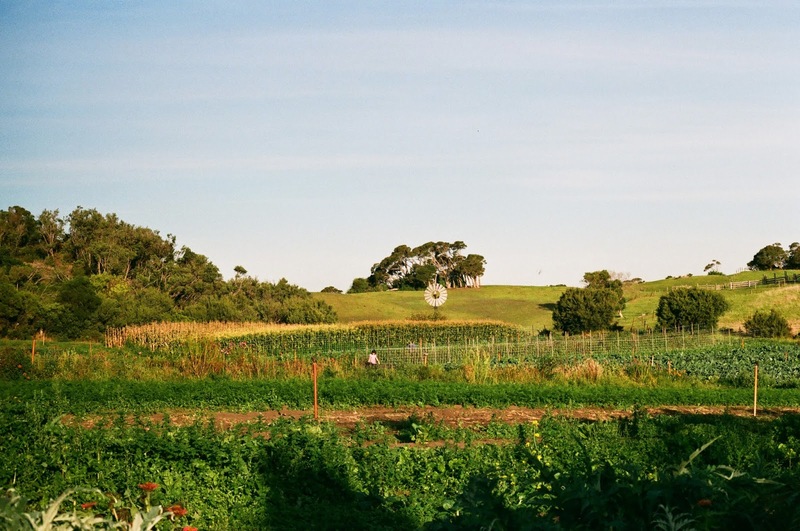 i found a farm on the mornington peninsula doing amazing things. i met them, and agreed to come and work for them for a few months. i would work for free and they would feed me and give me a place to stay and they would teach me. i arrived at their farm full of hope. three months later, i left full of gratitude. i remember meeting a beautiful girl named sophie about 5 years ago in ecuador. she had been travelling with her boyfriend, but then they had broken up, so she decided to go to a hostel in the middle of nowhere - a place in the mountains where i was working. she arrived during a quiet period and there was no one else staying at the hostel, so she and i spent a lot of time sitting by the fire with cups of tea and good conversation. we spoke a lot about lovers and the space they can hold in our lives. and we spoke a lot about our own passions, and the things that push us on and sustain us when there is no one else around to hold our hands. about encouragement being a responsibility we have to ourselves. she told me of a book she had read - about tuning in to your passions and figuring out what your ideals and ethics are, as a way of discovering direction and purpose in your life. i remember thinking that i should track down that book, but i never did. and i have thought from time to time that i should contact sophie and ask her what the heck that book was called, but i never did that either. instead, i came to this small little farm on the victorian coast and figured it out for myself. my body was made to farm. my hands were made to farm. my mind was made to farm. and everything else in my life is still important and worthwhile and wonderful, but this - this planting of seeds and harvesting of beets - this is what will see me through my days. this will be my hand to hold. and isn't it nice to feel that sense of place?! and it's not really about the location, although the peninsula is pretty beautiful. and it's not necessarily about the people, although they are some of the best people i've ever met. this sense of place has to do with me - being ready and present and in the right place with myself. there's this lovely song by wilco. it's called reservations, and i've always been drawn to it. there's this line, and it slips into my head from time to time and it always leaves me feeling so strange and undone and raw. because somehow, it manages to console me and haunt me, with just a few words. that's me - that's it. i waver - about a lot of things. i worry, and i doubt and i wonder. i'm hopeless at making decisions, even when the answer seems clear and obvious and important. i get anxious that saying 'yes' to something, means saying 'no' to another. i think i've had a hope that i would get to a point, or be in a situation where that doubt would slip away. even if it was just about one thing. i wouldn't mind all my other worries or concerns or reservations - because there would be something or someone to steady my path. something or someone that i would be so sure of. and it feels like this is it - that the 'you' in the song is maybe me? suddenly, i'm not doubting myself so much anymore. there are still so many things i'm confused about. i'm sure there always will be. but i get what i'm about now. i get who i am and what i need to do to be happy. i am made to make things and grow things. and that's enough. and so these days i am buzzing. i feel electric and present because i am sure. it's nice. it's so nice. this is such a wonderful post and story :) I'm at the point now, almost finished my nutrition degree … deciding what to do with my life. I don't really know yet - but I know I love my part time job, working at farmers markets in sydney and getting super excited about all the amazing produce! I would love to work on a small farm one day! I came to visit because Narf mentioned you in her latest post, but I expected to read about yarn or knitting, so this was a lovely surprise.